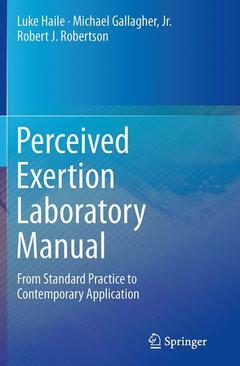 ​ ​This manual provides laboratory-based learning experiences in perceptually and psychosocially linked exercise assessment, prescription, and programming. The primary pedagogic outcome is the ability to use applied theory and practice in perceptual and psychosocial exercise assessment and program design to promote the adoption and maintenance of a physically active lifestyle, enhancing overall health fitness. Perceptual and psychosocial variables are presented in individual, stand-alone laboratory modules that can supplement existing curricula such as exercise and sport psychology, exercise physiology, exercise testing and prescription, and exercise training and conditioning. In addition, the complete modular set has a conceptual flow that allows its presentation as an entire, laboratory-based course. The laboratory modules are divided into three primary units: assessment (theoretical constructs, scales and procedures, tests), prescription (self-regulation, performance), and program evaluation. The manual uses a unique format in which case studies are embedded in the conceptual flow of each lab module facilitating translation of laboratory results to real-world application. The manual concludes with a discussion of perceptually and psychosocially linked exercise prescription and programming applications in public health, such as program monitoring and adherence. ​ Assessment. - Borg’s Range Model.- Effort Continua Model: Physiological Mediators.- Rest/Submaximal Exercise Measurements.- Laboratory designed for initial practice before more advanced assessments.- Scale Anchoring: Memory/Cognitive Compared with Exercise Anchoring.- Category Scale Validation: Concurrent and Construct.- Interchangeability of scales.- Advanced Scale Anchoring: Estimation-Production Protocols.- Application to leisure-time physical activity and research investigations.- Differentiated Perceived Exertion Model: Signal Dominance and Integration.- Treadmill and cycling: Chest/breathing, legs.- Advanced Differentiated Perceived Exertion Model.- Sub-maximal RPE Tests.- Fitness Measurement and Comparison of Individuals.- Multi-level cycle: PO R Score.- Single level cycle: R PO Score. RPE Run Test.- RPE Prediction of VO2MAX/VO2PEAK – Comparison with HR Models.- Resistance Exercise: RPE Measurement and 1-RM Prediction.- RPE Guided Water Shuttle Run Test. - Gender Effect on RPE.- Affect/Arousal Model (Circumplex) and Dual-Mode Model.- Prescription. - Estimation-Production Prescription Paradigm. - Group-Normalized RPE Zone: RPE at the Ventilatory Threshold. - Intensity Self-Regulation: Intra- and Inter-modal Interval Target RPE. Perceived Exertion JND.- Self-regulation of Exercise Intensity using RPE.- RPE Resistance Exercise Prescription.- Exercise Intensity Preference: Land and Water.- Environmental heat stress – Exercise in Hot versus Cool Environments: Effects on RPE, Affect, Enjoyment.- Program Evaluation.- Predicted – Actual (i.e. In-Task/Momentary). - Circumplex Model: Affect &, Arousal.- Match-Mismatch Paradigm: RPE, Pain, Affect, Arousal, Enjoyment, Aversion.- Session Responses: RPE, Pain, Affect, Arousal, Enjoyment, Aversion, Validation.- Sub-maximal RPE Tests for Tracking Physical Activity Participation: Multi- or single-level cycle, RPE Run Test, Exertional Recall and Exertional Observation.- Teleoanticipation. - Self-selected vs. Imposed Exercise Intensity (Target RPE – Produced).- RPE-based Resistance Exercise Program: Tracking strength/endurance. Dr. Luke Haile is Assistant Professor of Health Sciences at Lock Haven University of Pennsylvania. He received his Ph.D. in Exercise Physiology from the University of Pittsburgh. He received his B.S. in Exercise Science and his M.S. in Applied Exercise Physiology from Bloomsburg University of Pennsylvania. Dr. Michael Gallagher, Jr., received his Ph.D. in Exercise Physiology from the University of Pittsburgh. He earned his B.S. in Bioengineering with a concentration in Biomechanics from the Swanson School of Engineering and his M.S. in Exercise Physiology. Dr. Robert J. Robertson is Professor Emeritus of Exercise Physiology in the Department of Health and Physical Activity and the Center for Exercise and Health-Fitness Research at the University of Pittsburgh.